The Lenovo E50 is probably the best entry-level desktop on the market and will be perfect for those looking for an affordable solution, either for an individual, a family, or for businesses of all sizes. A long time ago, laptop manufacturers used desktop components to keep costs down. Taiwanese manufacturer ECS, for example, shoved a desktop processor into a laptop form factor without the battery and called it a desknote (desktop and notebook). Now Lenovo has gone the other way, using laptop components in a desktop computer – and it, kind of, makes sense due to economies of scale. Using the same components across different parts of your product portfolio means that you can theoretically bring down the bill of materials and have more flexibility in your supply chain. 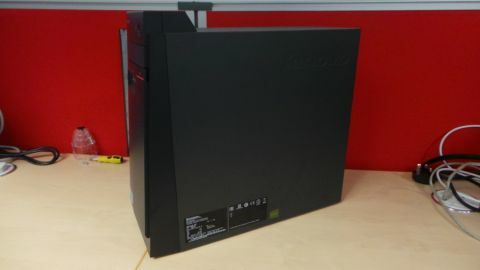 Meet the Lenovo ThinkStation E50 (90BX0018UK), which is also known as the ThinkCenter E50. It uses an external power supply unit, a 65W model, just like a laptop, to power the base unit, rather than an integrated one. If something goes wrong with it, you only need to send the PSU back rather than the whole thing, plus this method saves up to a third compared to a traditional desktop power supply. It also packs 4GB of DDR3 1600MHz memory as a single SO-DIMM module; you can expand it to 8GB but you will have to discard the existing RAM, which is a shame. The E50 is part of the ThinkStation family which means that it targets small and medium businesses, although as we've seen with laptops before, they're just as well suited for consumers. But being a B2B model doesn't mean that its design is boring – far from it. The E50's chassis is actually stylish, shying away from a bland, black box and opting instead for a charcoal coloured enclosure with an integrated handle (for easy transportation) with a hidden bay that hosts an optical drive (DVD writer) and hidden air inlets. It's worth noting that the E50 weighs less than 10Kg. On the front of the case are two USB 2.0 ports, audio connectors, the power button and a One-Key Rescue System that restores your computer to its original factory state. At the rear are two PS2 connectors, a VGA port, and a serial port for legacy peripherals as well as a single USB 3.0 port, two USB 2.0 ports, a GbE connector, three audio ports and a power connector. The E50 runs a quad-core Intel Pentium J2900 Bay Trail-based processor. The 22nm CPU has 2MB L2 cache, four threads, a base frequency of 2.41GHz (with a 10% overclocking potential) and a TDP of only 10W. Note that the processor still uses an active heatsink fan. An Intel HD graphics unit is built into the processor. It has a base frequency of 688MHz, going up to 896MHz, which should make it fairly decent for low-resolution gaming. You can only connect one monitor to the E50 although you can use a docking station like the Startech one to triple that number. The rest of the components inside the case include a 3.5-inch Western Digital 500GB 5400RPM hard disk (these are still way cheaper than their equivalent 2.5-inch models), a motherboard that has two SATA connectors, a PCI Express x16 slot and another one that takes PCI Express x1 components. To get inside, you only need to remove two screws (you will need a screwdriver) at the back, then slide a panel. There's only one internal 3.5-inch bay free, the other being taken by the optical disk drive. There's plenty of space inside the case and I get the impression that Lenovo recycled some of its unused mid-ATX cases. As for the bundled keyboard and mouse, they are similar in quality to other value peripherals. The Lenovo keyboard reminds me of a laptop keyboard with short keys and an even shorter travel. Other than Windows 8.1 with Bing, the ThinkStation E50 also comes with McAfee antivirus, Accuweather, Adobe Reader, Skype, Evernote, a trial version of Office 2013 plus a slew of Lenovo applications (Companion, Rescue System, Solution Center and Desktop Power Manager). As long as you don't expect the moon, you will not be disappointed with the Lenovo E50 – just bear in mind that the processing technology that powers it is usually found in tablets and smartphones. Unfortunately, we couldn't run PCMark 8 on the E50 while one 3DMark test refused to run; we have contacted Futuremark to find out why and will update this review when we get a reply. The E50 scored 6fps and 159cb respectively on Cinebench's OpenGL and CPU benchmarks. GPU and CPU-wise, that's similar to the Core i3-3227U, an Ivy Bridge part that powered the Acer Aspire Z3 we reviewed last year. A pretty impressive achievement.